Having just recently acquired the new gorgeous Eric Rohmer boxset, published on a limited edition by Potemkine in France, I have decided to embark on an ambitious project, given my lack of free time: I shall watch (or rewatch) every single one of his films in no particular order, and review them as I go along. These reviews will be short, as such is the plight of the casual blogger, but I figured shorter reviews are better than nothing. Reviews will be published both on my blog and Letterboxd, which I implore you to join. So starting today, L'arbre, Le Maire Et La Mediatheque. French reviewers weren't very kind with Eric Rohmer in the 90's. He was seen as dated, redundant, completely out of touch with modern French cinema of the time. Which is truly baffling, considering how timeless and topical a film like this comes across now. Even among his fans, this is seen as a minor work yet it actually tackles some rather mighty issues. We are used to him dealing with relationships but here the film is all about politics, as well as, to a lesser extent, coincidences and their consequences. It offers a fascinating insight into French politics and in fact, this might sound like a bold statement, but it would give an outsider everything they would need to know about French society. It pits a green progressivist politician with the ambitious project of opening a large cultural centre in a small village against a local teacher who is firmly against it. Left wing against right wing, cities against the countryside, politicall idealism against careerism, globalisation, it actually feels pretty relevant still now, considering the ongoing identity crisis that France has been facing over the last decades, and its struggle to keep its traditions while keeping up with progress. It also questions the place and the need for culture in society, and its cost among what is perceived as more pressing priorities in difficult economic times (sounds topical enough?). It even predicts the rise of neo-cons! Not only that, but it also foresees, well before the internet exploded, the birth of digital nomads. Sounds heavy going? 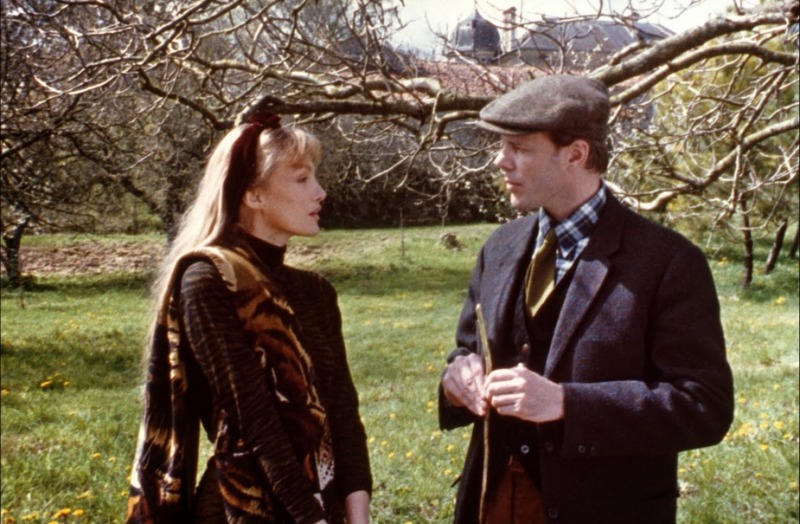 Not at all, Eric Rohmer does it with his usual charm and lightness of touch, hopping on and off from character to character to keep it lively. I must admit I often find Fabrice Luchini grating and his performance here is no exception. But thankfully the film also features one of Rohmer's muse, Arielle Dombasle, with her sphinxian beauty (she basically hasn't changed one bit from the 70's, having seen her in the flesh last year), and whose affected delivery the perfect match for Rohmer's light yet erudite dialogues. I don't want to spoil it but the films ends on a particularly amusing note, which is kind of spoiled in the trailer below so don't watch it if you want to keep the surprise intact!